It’s much better up here. Picture yourself gazing at the amazing views of the surrounding mountain vistas as you scale your way along a cliffside. Your heart will be pounding as you navigate from one iron rung to the other, cross a variety of suspended bridges, and zipline among the treetops. Here’s your outlet to fully embracing your daring side… just don’t look down. Just over 30 minutes west of Denver into the Rocky Mountains of Colorado, AVA’s Mount Evans Via Ferrata makes the perfect weekend getaway if you’re on the hunt for an adventure. A 70-foot rappel, maze of iron rungs set into the cliffside, assisted rock climbing, 50-foot free fall, and array of suspended bridges will keep your heart pumping as you challenge yourself on this course. 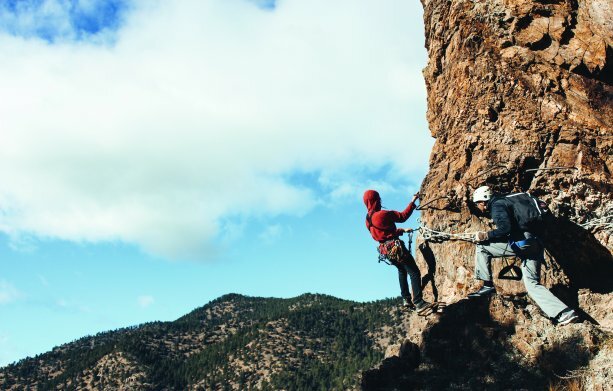 Nestled at the base of the mighty Collegiate Peaks in the Arkansas River Valley, AVA’s newest Via Ferrata course will have you on the edge of your seat. Between ziplining, rappelling, crossing a tight rope suspended bridge, and traversing the cliffside with a 70+ foot drop below you, we’re not sure if it will be the views or the thrills on this course that will take your breath away first. What exactly is a Via Ferrata? No worries, this fairly new recreational activity used to be overseas as a means of transportation among the mountaintops. Today, it’s a challenging and fun adventure, and AVA has two different courses in the Colorado Rockies. What do I bring on the Via Ferrata? Valid question. AVA provides all your climbing gear, but you are required to wear comfortable, athletic clothing as well as shoes that will stay on your feet. We suggest bringing a water bottle with a carabiner to attach to your harness, and small cameras are welcome to capture your adventure. 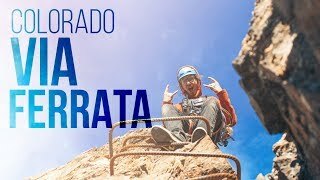 Why should I try the Via Ferrata? Maybe you’ve ziplined before and are on the hunt for something more, or maybe you’re just looking for a unique way to spend your time in Colorado. Whether you’re just wanting a weekend getaway in the mountains or you’re visiting from across the country, the Via Ferrata will challenge you in the best ways and you’ll make some great memories along the way with your family and friends.